Mathematics development is usually facilitated by breakthrough and creative thinking. 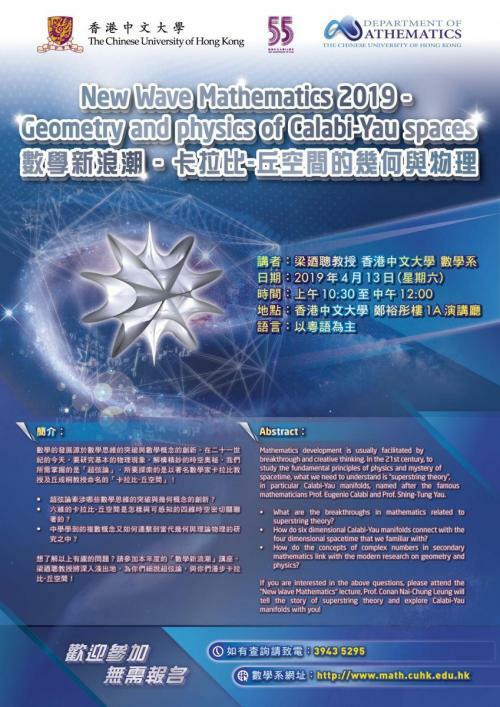 In the 21st century, to study the fundamental principles of physics and mystery of spacetime, what we need to understand is “superstring theory”, in particular Calabi-Yau manifolds, named after the famous mathematicians Prof. Eugenio Calabi and Prof. Shing-Tung Yau. • What are the breakthroughs in mathematics related to superstring theory? • How do six dimensional Calabi-Yau manifolds connect with the four dimensional spacetime that we familiar with? • How do the concepts of complex numbers in secondary mathematics link with the modern research on geometry and physics? If you are interested in the above questions, please attend the “New Wave Mathematics” lecture, Prof. Conan Nai-Chung Leung will tell the story of superstring theory and explore Calabi-Yau manifolds with you!